By late summer in the desert, we're all looking for something to do other than take another dip in the pool. Why not bust your boredom at one of our Cactus Flower summer events? Not only will you have a great time with fun people, but you'll walk away with new knowledge and something to enjoy in your home, whether it's an herb garden for your kitchen or a succulent garden for your office. Check out our summer events calendar and reserve your seat today! Celebrate National Ice Cream Month at our family ice cream social. Kids will get to make their very own "ice cream soda" to take home. After their masterpieces are created, they can enjoy a REAL ice cream sundae with toppings! Make one of our top-selling items for your own home or office, or give it as a handmade gift. You'll make a dish of beautiful succulent plants, perfect for indoor or outdoor use here in the desert. This Father's Day, make Dad a terrarium - the coolest gift he'll receive! Does he really need another mug? This Father’s Day, have the kids make him something he’ll enjoy every day in his office or at home: a custom terrarium. You’ll build an open-air terrarium using dirt, river rock, decorative stones and small green plants. We’ll even have some decoration to customize it according to Dad’s hobbies – or bring in your own embellishments! 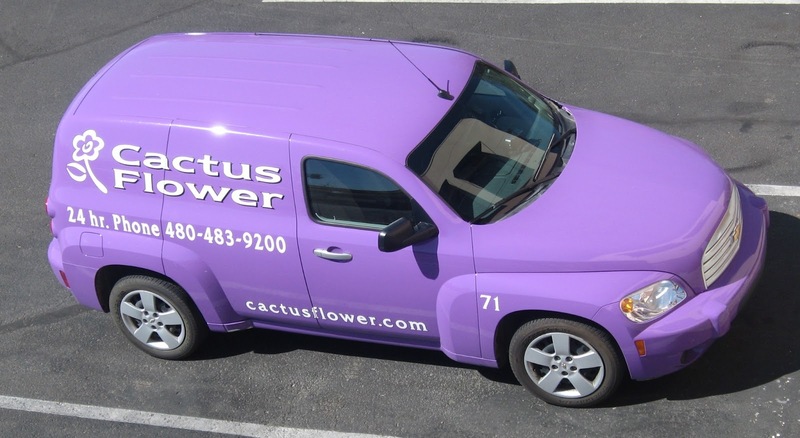 Have you ever pulled behind one of our ubiquitous purple delivery vehicles at a stoplight? Have you seen one parked in front of your workplace? 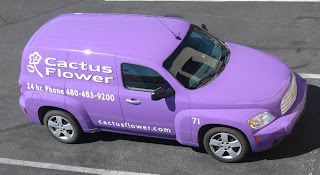 The next time you see purple in your neighborhood, snap a picture and upload it to either our Facebook page or Twitter page with the hashtag #iseepurple, or you can email it to us at info@cactusflower.com. You'll be entered in for a chance to win flowers for a year! We'll be pick a lucky winner on July 31.Enter the contest as many times as you see purple in your neighborhood!